GOLD AND BLACK ILLUSTRATED VOLUME 28, ISSUE 6 72 has many leaks. 7 Illinois Other than the offense not being able to score and the defense being putrid, everything is peachy in Champaign. Is it just us, or does the Lovie experiment not seem to be working out? 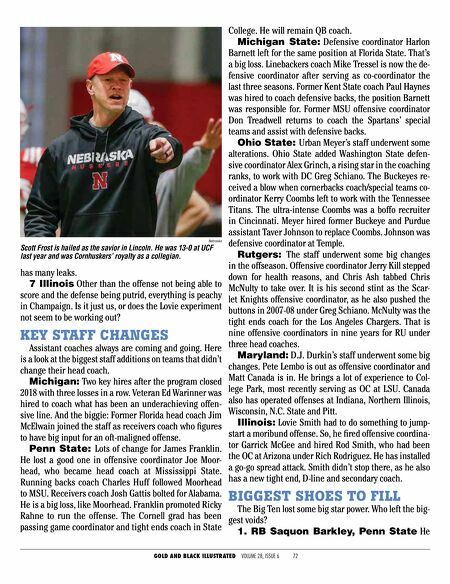 KEY STAFF CHANGES Assistant coaches always are coming and going. Here is a look at the biggest staff additions on teams that didn't change their head coach. Michigan: Two key hires after the program closed 2018 with three losses in a row. Veteran Ed Warinner was hired to coach what has been an underachieving offen- sive line. And the biggie: Former Florida head coach Jim McElwain joined the staff as receivers coach who figures to have big input for an oft-maligned offense. Penn State: Lots of change for James Franklin. He lost a good one in offensive coordinator Joe Moor- head, who became head coach at Mississippi State. Running backs coach Charles Huff followed Moorhead to MSU. Receivers coach Josh Gattis bolted for Alabama. He is a big loss, like Moorhead. Franklin promoted Ricky Rahne to run the offense. The Cornell grad has been passing game coordinator and tight ends coach in State College. He will remain QB coach. Michigan State: Defensive coordinator Harlon Barnett left for the same position at Florida State. That's a big loss. Linebackers coach Mike Tressel is now the de- fensive coordinator after serving as co-coordinator the last three seasons. Former Kent State coach Paul Haynes was hired to coach defensive backs, the position Barnett was responsible for. Former MSU offensive coordinator Don Treadwell returns to coach the Spartans' special teams and assist with defensive backs. Ohio State: Urban Meyer's staff underwent some alterations. Ohio State added Washington State defen- sive coordinator Alex Grinch, a rising star in the coaching ranks, to work with DC Greg Schiano. The Buckeyes re- ceived a blow when cornerbacks coach/special teams co- ordinator Kerry Coombs left to work with the Tennessee Titans. The ultra-intense Coombs was a boffo recruiter in Cincinnati. Meyer hired former Buckeye and Purdue assistant Taver Johnson to replace Coombs. Johnson was defensive coordinator at Temple. Rutgers: The staff underwent some big changes in the offseason. Offensive coordinator Jerry Kill stepped down for health reasons, and Chris Ash tabbed Chris McNulty to take over. It is his second stint as the Scar- let Knights offensive coordinator, as he also pushed the buttons in 2007-08 under Greg Schiano. McNulty was the tight ends coach for the Los Angeles Chargers. That is nine offensive coordinators in nine years for RU under three head coaches. Maryland: D.J. Durkin's staff underwent some big changes. Pete Lembo is out as offensive coordinator and Matt Canada is in. He brings a lot of experience to Col- lege Park, most recently serving as OC at LSU. Canada also has operated offenses at Indiana, Northern Illinois, Wisconsin, N.C. State and Pitt. 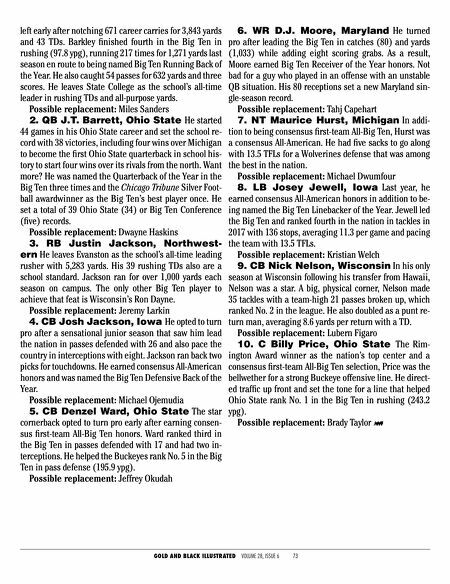 Illinois: Lovie Smith had to do something to jump- start a moribund offense. So, he fired offensive coordina- tor Garrick McGee and hired Rod Smith, who had been the OC at Arizona under Rich Rodriguez. He has installed a go-go spread attack. Smith didn't stop there, as he also has a new tight end, D-line and secondary coach. BIGGEST SHOES TO FILL The Big Ten lost some big star power. Who left the big- gest voids? 1. RB Saquon Barkley, Penn State He Nebraska Scott Frost is hailed as the savior in Lincoln. He was 13-0 at UCF last year and was Cornhuskers' royalty as a collegian.